stainless steel 1000 x 600 x h900 mm Stainless steel kitchen cart of the series Auxilium with two drawers and two shelves underneath. The stainless steel working top is very robust and sturdy. The drawers are made of stainless steel and can be easily detached for cleansing. The cart has one side rail on the left and one on the right for quick fitting of accessories or a kitchen cloth. 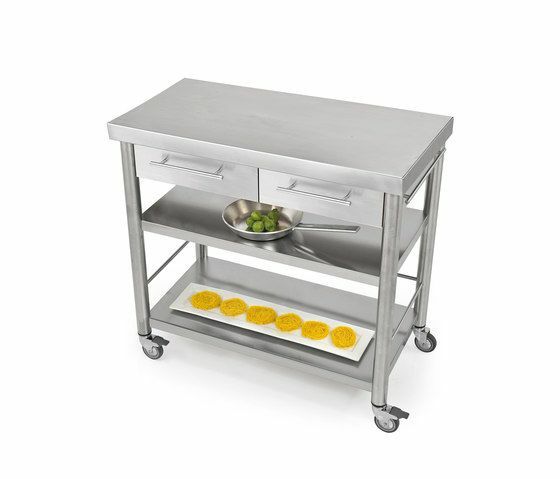 Flexibility, functionality, and aesthetic clarity... those are the demands we expect kitchen carts to meet. On the basis of this maxim, we created auxilium, the mobile kitchen helper. Whether you want to use it as a surface for your kitchen tasks, as a storage place for your kitchen appliances and implements, or to serve an aperitif to your guests: auxilium allows you to work flexibly and can assist you in many different ways. Both in classic hornbeam, elegant corian, or professional stainless steel – auxilium will follow you to wherever you need it now. "You don‘t need much to do something right… and even less to do it wrong." Paul Bocuse Company In 1922, the little town of Salurn situated in the mountains of South Tyrol was in need of a wheelwright.